She went to the broad window and looked out. As she suspected, it had an excellent view of the exact place where Russell had first warned her to stay away. “You were about to give me a masterful setdown then, were you not?” he asked, coming to stand behind her at the window. “I’m glad I didn’t have the opportunity to do so,” she murmured in pleasure. He had not left after all, and she was delighted, hardly caring that a small crowd of gawkers gathered in the street below. Already there were those who hoped to catch a glimpse of London’s most scandalous couple. In Notorious Vow, the villa featured in the above passage was inspired by Chandos House in Queen Anne Street. You might know it from the superior Ang Lee-directed movie, Sense and Sensibility, which highlighted the bright interior of Mrs. Jennings’ London home. In my novel, Vivien was particularly enchanted that the villa was a stand-alone house, a rarity in London. Its Georgian brick had been refaced with a creamy stucco exterior. The bow windows on each floor gave an unhindered view of Hyde Park, ornamented on either side by beautifully carved pilasters. 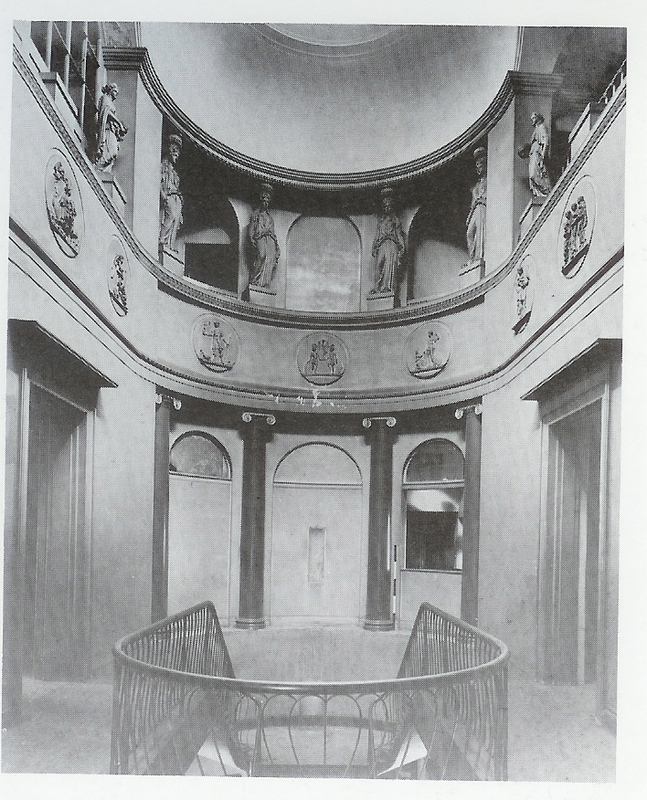 The staircase (view to the right) from Buckingham House (demolished in 1908) played a notable part in the novel. This entry was posted in Notorious Vow, Regency and tagged Chandos House Buckingham House Sense & Sensibility Hyde Park Villa by Angelyn. Bookmark the permalink. It looks and sounds lovely.